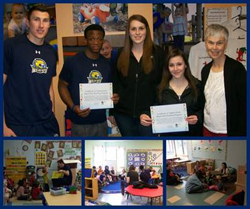 Caz College Students Participate in "March into Reading Program"
Student-athletes from the Cazenovia College men's and women's basketball program took part in the Cazenovia Children's House "March into Reading Program" on Tuesday, April 22. Juniors Ryan Gavin (Syracuse, NY), Malik Adair-Mountain (Syracuse, NY) and Haley Zambito (West Bloomfield, NY), along with freshman Mary Salo (Westerlo, NY) participated in the program that encourages and promotes the importance of reading to the children at Cazenovia Children's House. Gavin, Mountain, Zambito and Salo read several books to the children before spending some time discussing the importance of school, staying active and the mantra of the day – reading. "This was a wonderful experience and an even better opportunity to promote the importance of reading to the children," said Gavin. "We would like to thank the Cazenovia Children’s House for the opportunity to participate in such a great program." Cazenovia College looks forward to continuing its relationship with the Cazenovia Children’s House as plans are already underway to include more student-athletes in future programs and initiatives.